These are a classic Christmas cookie all around the country, and yes, even in the Deep South for many! 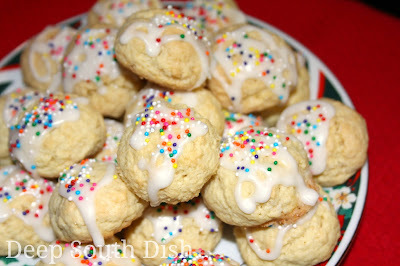 I love them, for one, because they are as easy to make as spritz cookies, but also because they are a slightly different take on the classic butter cookie. One bite and you wonder, hmmm.... what is that? Most folks can't quite put their finger on what though, because the flavoring is anise. Anise is a bit of a unique flavor, kind of like a distant cousin to the licorice family, though it is more closely related to fennel and tarragon, and not licorice. It's used in other cultures in everything from savory to sweet dishes and even adult beverages. The flavor is strong, but subtle because I'll tell you flat out, I'm not a fan of black licorice myself, but I enjoy anise. If you're not familiar with it and unsure how you'll feel about it as a flavor, feel free to substitute almond, vanilla or lemon flavor for this cookie, or even use a combination of anise with any one of them. 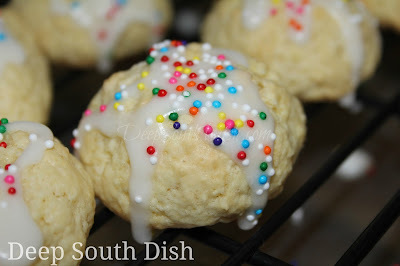 Another reason I love these cookies is that I am not big on sweets and this isn't an overly sweet dough, though you could certainly increase the sugar just a tad more if you prefer a sweeter cookie. These cookies will puff when they bake so be sure to roll the balls small. You could also make a drop cookie if you prefer. You should get about four dozen cookies from the batch, though how many you end up with will depend on how big you roll the balls. Recipe may also be successfully doubled if you want more. Beat together the butter and sugar until well blended. Add the eggs, milk and extracts; blend on low. Blend in the flour mixture. Use a damp paper towel to wipe your hands - this will help to roll the dough without making it too wet - and roll dough into smooth, small balls, placing onto an ungreased cookie sheet, about 2 inches apart. I use a Wilton air bake cookie sheet. Bake for about 15 minutes or until lightly browned on the bottoms. Transfer to a rack to cool. Whisk together powdered sugar, butter and lemon juice until blended. Add milk, 1/2 teaspoon at a time until glaze is thick but a still pourable consistency. Correct as needed with additional powdered sugar or milk. I use a squeeze bottle to make an easy job of drizzling the icing on, but you can also just dip the cookie tops into the glaze as well. Sprinkle the nonpareils on top of the wet glaze and set aside until fully dry. These can be flash frozen on a tray, then packed in freezer bags or stored in an air tight container at room temperature for a few days. Refrigerate for longer storage. Recipe doubles nicely. Beat together the butter and sugar until well blended. Add the eggs, milk and extract; blend on low. Blend in the flour mixture. Use a damp paper towel to wipe your hands and roll dough into smooth balls, placing onto an ungreased cookie sheet, about 2 inches apart. Bake for about 15 minutes or until lightly browned on the bottoms. Transfer to a rack to cool. Whisk together powdered sugar, butter and lemon juice until blended. Add milk, 1/2 teaspoon at a time until glaze is thick but a still pourable consistency. Correct as needed with additional powdered sugar or milk. Use a squeeze bottle to drizzle over the cooled cookies or dip tops of cookies into glaze, add sprinkles and set aside to dry. *Cook's Notes: Recipe doubles nicely. If you are unsure about the anise, you may also make these cookies with other flavorings, such as vanilla, almond or lemon or with a combination of anise with one other. I use an ungreased, Wilton air bake cookie sheet. We love anise cookies at our house...of course it's a recipe I brought with me from 'up north' but everyone likes them anyway! Thanks for this recipe, it's different from mine and I can't wait to try it! Thanks for letting me know I'm not the only one in the south who loves Anise cookies! Oh no, you're not alone at all! Heck the grocery stores even sell them around here! !